We offer several orthopedic pillows with an array of features and options from high quality fiber, neck lobes in a choice of firmness levels, a range of prices...you name it. Our TriCore - the most recommended in the business - comes in sizes to fit the whole family. Our most versatile support pillow, the AquaCore, is suitable for every stage of care. We suggest you get input from your doctor on which type of pillow is best. Then you're sure to find the right one for you. Variety of sizes for comfort, neck pain and headache relief. 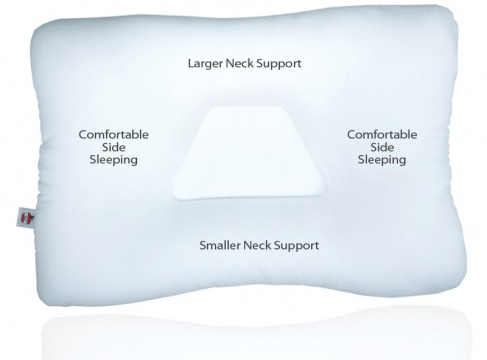 #1 Fiber Support Pillow recommended by chiropractors. Made with premium quality fiber. Helps relieve headaches, joint strains, arthritis, neck injuries and more. For both back and side sleepers. A drug-free way to help alleviate head and neck pain…even snoring. Available in three sizes, everyone benefits. Use in Correct and Maintain stages of care. Mid-size version of our Tri-Core, the industry’s #1 fiber support pillow. Supports neck to relieve pain, restore natural curvature. Comfort for back and side sleepers. Petite-size version of our Tri-Core, the industry’s #1 fiber support pillow, sized for children and small adults. Gently supports neck to relieve pain, restore natural curvature of the neck. Finally, a water pillow with proper neck support. Two different sized lobes with four interchangeable cores. Precision-cut foam to provide cervical support from mild to extra-firm. Select the level of support that's right for you. Premium memory foam layer for extra comfort. Precision-cut foam base provide added cervical, neck support. Provides the therapeutic comfort of the popular Tri-Core. Supports your neck to help prevent stiffness from sleeping or sitting. Compact size makes it easy to carry. Helps relieve pressure and strain on lower back, knees and ankles. Moves with you when you turn over. Because once an ankle's been injured it's likely to happen again, doctors usually recommend wearing ankle supports during high activity levels or intense sports - and sometimes for work and leisure. It just makes sense to be protect yourself. Core's Lace-Up Ankle supports offer maximum adjustability, to provide just the right level of support while you engage in a wide range of activity levels. Each has its distinct features: the regular Lace-Up, with spiral stays; the Deluxe, with removable stays and a patented, offset lacing system, plus vinyl side supports. And the PowerWrap® which offers maximum support and customization. All sized from XS to XL so you can truly get the right fit and get back out there to your "regular" life. We suggest you get input from your doctor on which type of support is best. Then you're sure to find the right one for you. Great for sports, home, work, and leisure. Ideal for sports or high activity. Features triple-layered fabric, spiral stays, lined tongue and side panels. Control swelling as you receive reassuring support. If you suffer from stiff, swollen and painful ankles or have recently injured (or re-injured) your ankle, you may be wishing you felt more steady on your feet as you get back "out there." Core makes two elastic ankle supports that deliver the benefits of compression... no matter what shoes you wear. The latex-free Elastic Pull-On controls swelling, gives a feeling of ankle strength via dual-tension elastic and figure-eight construction. Our Lightweight Elastic Support - for use during or after sports - and less strenuous activities - features cool, ventilated elastic and front lace-up construction to help control swelling; spiral stays give added support plus adjustability. Now you can wear your dancing shoes and take care of your ankle, too! Aids stiff, swollen and painful ankles and arches. Ideal for sports, work, home, and leisure. Ideal for sprains, strains, and soft-tissue injuries. Ideal for many types of activities. Fits comfortably in street or dress shoes. Lace-up front and spiral stays add support. The "Trainer" model with the Neoprene padding system, two straps and a bilateral hinge provides unequaled ankle protection for chronic instability, or preventative use when increased activity levels are presented in rehabilitation. Comfortable pull-on support, yours in many models. For those who prefer Neoprene and the "pull on and go" approach vs. wraparound styles, Core offers a whole family of comfortable, contoured neoprene pull-on supports. .
Like all of Core's joint and back support products, their knee supports are designed with varying levels of breathability, compression, flexibility and stability – which is important when muscles or ligaments have been weakened or damaged from a whole range of causes. We suggest you get input from your doctor on which type of support is best. Then you're sure to find the right one for you. Slip-on design, full range of motion, ideal for sports, work or home. Flexible spiral stays and compression straps add support. Supplements the knee’s muscles, cartilage and ligaments. Neoprene lined in nylon retains natural body heat to aid healing. High-quality neoprene with hinged metal stays. Dual straps for increased compression above and below the knee. For minor strains, sprains, and arthritic conditions. Uniform compression promotes circulation and helps reduce inflammation. Easy to wear, aids injured or weak knees. Provides maximum compression, superior support for extreme activities. Neoprene retains natural body heat for increased circulation and warmth. Washable, available in four sizes. Easy on and off... with support features galore. For those who prefer neoprene and the easy on, easy off convenience of wrap-around knee supports, Core offers a whole family of models to give your knee added support. Support that's needed when muscles or ligaments have been weakened or damaged, as in cases such as patellar dislocations, arthritic knee conditions, chronic and unstable knees, sprains and strains. Easy-on/easy-off design, ideal for strains, sprains and arthritic conditions. Open patella with removable buttress pads. Plush neoprene provides healing warmth. Two sizes, fits either knee. Soft nylon cloth lining, high-quality hook-and-loop straps. Reduce patellar subluxation and dislocation. Improves patella tracking and elevation. Flexible by design to get you up and active again. When your knees are "killing you" it's tough to do the things you want – and like – to do. Pull-on elastic supports make it easier to get out and stay active, which, in turn, may help get rid of stiffness and help strengthen the knee. Each of Core's elastic knee supports is designed to address different needs, including basic support and compression for weak and injured knees. Effective joint control for weak or injured knees. Aids stiffness, swelling, and pain. Ideal for sports, work, home, or leisure. Support and warmth for groin, hamstring, and quadricep injuries. Help return arms and shoulders to health. Given the hard work we expect of our arms and shoulders, it pays to pamper an injury or support their rehabilitation after surgery. Our lightweight cotton/poly Universal Arm Sling supports the arm following surgical or non-surgical treatment of bone, muscle or ligament injuries to the hand, arm and shoulder. Durable and easy to wear, it features adjustable straps to ensure a proper fit. Our Shoulder Immobilizer serves its function by gently securing the humerus and forearm to the torso. Plush elastic and adjustable straps ease its application and positioning. If your goal is to improve your posture, our comfortable Posture Corrector fits snugly and inconspicuously under most clothing, helping hold your shoulders in a neutral position and helping reap the lifelong benefits of proper posture – a healthier back. Lightweight, durable and easy to wear. Strap adjusts easily to ensure a proper fit. Gently secures humerus and forearm to torso for shoulder immobilization. Plush elastic and adjustable straps ease application and positioning. White cotton canvas with two flexible stays. Shoulder straps provide a snug, comfortable fit. Support for elbow ailments - from major to minor. Elbow supports are designed for temporary relief of acute, sub-acute or chronic inflammation of the elbow - whether that's an injury requiring the R.I.C.E. treatment regimen, one that's healing and will benefit from added support, or a chronic case of weakened tendons or arthritis. Core offers a range of supports to suit all these needs - including one that accommodates an ice pack (see below). Support and comfort for tendonitis, rheumatoid arthritis and similar conditions. Focuses effective, gentle pressure below the elbow while maintaining a full range of motion. Features hook-and-loop closure and plush lining. Helps alleviate pain due to tennis elbow, supinator muscle strain and tendonitis. Applies pressure below the elbow while maintaining a full range of motion. Epicondyle pad focuses effective, gentle pressure. Contoured neoprene construction for healing warmth. Treat injured elbows with a comfortable elbow support combined with medically accepted cold therapy. Dual comfort cold pack can be conveniently attached. Provides cold therapy with compression. For weak or injured elbows. Helps reduce chance of scuffs during sports. Gives reassuring feeling of strength. Safely, conveniently delivers ice to the spot. Anyone who has ever injured a wrist and been told to apply the R.I.C.E. regimen (rest, ice, compression and elevation) ASAP knows what a challenge it can be to safely apply ice to a wrist and also combine it with the correct level of compression. Core Products came up with a solution that combines two of our most popular Wrist Supports with a perfectly sized DualComfort Pack. That way you get the proper compression plus the medically accepted benefits of ice, delivered either rapidly or more slowly, depending on which side of the DualComfort Pack you place next to your skin. Comfortable wrist brace combined with medically accepted cold therapy. Puts cold therapy where your wrist needs it. Brace is excellent for injured or weak wrists. Fits right or left in four different sizes. Soft, plush, "frost-free" surface protects your skin. Open palm design with an adjustable thumb strap. Provide comfortable relief from repetitive motion. Get relief, comfort and active support. Supporting your wrist with the right brace can help reduce discomfort from a sprain or strain as it begins to heal and during rehabilitation, and also protect it from re-injury. Arthritis sufferers also welcome this reassuring feeling of support during regular, and even more vigorous, activities. Core's makes wrist braces to address all these needs. We suggest you get input from your doctor on which type of support is best. Then you're sure to find the right one for you. Relief and comfort from stiffness, swelling and pain. Provides support without interfering with activities. Dual-tension elastic, one-piece design pulls over the hand for a smooth, snug fit. Fits either wrist in four different sizes. Enjoy therapeutic support for problem wrists. Cores wrist splints and immobilizers are alleviate pain and provide recommended support to those coping with carpal tunnel, overuse syndromes and other wrist ailments. Each is made with quality materials whose properties best serve the function of that design: to provide compression and help position the wrist, to protect the thumb and wrist, and to immobilize the wrist and forearm. Effective compression in an ambidextrous design. Ventilated elastic construction for cool comfort. Elastic tension strap provides superior compression. Removable, reshapable aluminum palmar spoon. Helps protect wrist and thumb from following injury. Helps decrease pain and inflammation from tendinitis. Cotton/polyester construction with soft, cotton liner. Two metal stays support wrist and thumb. Comfortable and secure wrist and forearm immobilization. Features a shaped palmar spoon and lateral stays. Dual hook-and-loop straps allow for custom fitting. Natural relief for painful wrist ailments. Core Products offers a range of wrist supports designed to address the specific challenges of people coping with carpal tunnel, overuse syndromes and other wrist ailments. They're made from materials chosen with specific properties in sync with the function of each design. Some are sized, available in both black and white - others adjustable, some ambidextrous and some not. Helps provide comfortable relief from repetitive motion. Features an open palm design with an adjustable strap for comfort. The elastic tension strap provides added compression. Molded reflex pad eliminates the need for metal stays. Contoured design features plush neoprene construction for healing warmth. Universal sizing, fits either wrist. Good for carpal tunnel and other repetitive motion disorders. Cool, ventilated elastic construction features thumb loop for easy application. Abducted thumb position helps relieve inflammation associated with repetitive motion disorders. Neoprene design for healing warmth. Elastic compression strap for flexion and extension control. Hook-and-loop closure provides easy size adjustment. Our most popular back support is Core’s Lumbosacral belt. Proportionally sized in height and length, Core's patented CorFit® Belt Fitting System provides exceptional back support for everyone from children to large adults. It helps reduce pain and prevent injury by delivering the abdominal compression critical for lower back support. Our three models include: the CorFit, CorFit Industrial and CorFit Sacroiliac, which sits lower and gives added pelvic support. Like all of our back and joint support products, CorFit Belts offer specific levels of breathability, compression, flexibility and stability - information you'll find on each product page. We suggest you consult our Product Rating Guide for a brief explanation of the four criteria, and get input from your doctor on the type of support that's best. Then find the right one for you. Patented proportional fitting system gives you taller belts for larger people, shorter belts for petites and children. Side pulls and elastic back panel provide superior abdominal compression, help relieve back pain, reduce risk of strain or injury. Wicking material draws moisture away to help you stay dry, CorEdge finish is comfortable, non-binding. Washable. Quality materials and construction ensure years of comfort and use. Improved CorEdge® finish for comfort. Designed to relieve instability and painful stress of the pelvis and sacroiliac joints. Provides support and stabilizes the sacrum. Small 4" Regular 5" X-Large 6"
Provides complete compression through a full range of motion. One of our most versatile, popular back supports. High quality plush elastic, design offer a good range of motion. Cool to wear, excellent for warm climates. Criss-cross strapping system stabilizes lumbosacral region. Removable pad increases pressure to spine. Get serious preventive support right here. When heavy lifting and repetitive motion are a regular part of your life, the wear and tear on your lower back really adds up over time. Using different fabrication and features, Core's Industrial Supports help reduce the risk of injury, remind you to use proper lifting techniques, and help alleviate muscle strain and spasms while supplementing the abdominal musculature. Like all of Core's back and joint support products, they're designed with varying levels of breathability, compression, flexibility and stability. Our Product Rating Guide grades, by number, the levels of each of these properties – information you'll find on each product page. We suggest you also get input from your doctor as to what level of support is best. Then you're sure to find the right one for you. Helps reduce inflammation and stress on the lower back. Stays help prevent rolling and add support. Comfort, support at an affordable price. Adjustable compression helps ease pelvic stress. Core's sacroiliac supports are designed to relieve instability and painful stress of the pelvis and sacroiliac joints, and to help reduce inflammation. All models adjust to fit snugly around the pelvis, with the Elastic and Triple-Pull models including removable sacral pads for extra support. The CorFit model is proportionally sized to fit everyone from children to large adults. For temporary low-back pain relief. Similar function as Sacroiliac belts, less bulk. Core's low-profile Trochanter Supports help relieve muscle strain and supplement abdominal muscles by supporting the pelvic and sacrum regions. Both models offer maximum flexibility. And at just 2"high, the Elastic Trochanter (providing such activity is appropriate) can be worn during recreational activities. Semi-Universal features hook and loop closure. Like all of Core's back and joint support products, they're designed with varying levels of breathability, compression, flexibility and stability. Our Product Selection Guide grades, by number, the levels of each of these properties - information you'll find on each product page. We suggest you also consult our Product Selection Guide for a brief explanation of the four criteria and stages of care, add input from your doctor what degree of support is best. Then you're sure to find the right one for you. Durable, plush body provides maximum support. Elastic insert adds stretch and compression. Your hedge against rib and back pain. Core's abdominal binder helps reduce strains to the muscles ligaments and joints, especially after surgery. Made from multi-tiered, plush elastic, it may also serve as a large rib belt or back support. Our Fitted and Universal Rib Belts are designed to comfortably stabilize and support the rib cage. Because fit is important, they are sized for both women and men. Like all of Core's back and joint support products, our rib and ab binders are designed with varying levels of breathability, compression, flexibility and stability. Our Product Rating Guide grades, by number, the levels of each of these properties. We suggest you also get input from your doctor as to what level of support is best. Then you're sure to find the right one for you. Stabilizes and supports the rib cage. Female belt contours for comfort around the bustline. Large/XLarge fist 36" to 48"
Should all expecting mothers wear a maternity support? Yes, especially for first-time mothers. Wearing a maternity support during your pregnancy will protect your ligaments from overstretching, a major cause of incontinence later in life. During your pregnancy, maternity supports can help relieve back pain and pelvic pressure, keeping you active and comfortable. Maternity supports will also protect your body from developing future discomforts, such as edema, incontinence, weakened or overstretched abdominal muscles and stretch marks on the skin. Maternity supports also provide postpartum support for weakened or sore muscles and ligaments. Helps the "falling out feeling"
Relieves strained muscles and ligaments.